There are many things that make the heart ache when you have a parent or loved one who suffers from Alzheimer’s disease. The worst of them is when your parent or loved one no longer recognizes your face and does not know who you are. Each time you visit a parent or loved one with Alzheimer’s disease, you carry a hope that there will be a flicker of memory, a lingering familiarity that allows them to remember you, to recognize your face if not your name. There is an indescribable sadness when you visit and it feels as if there is simply no connection. You carry all of your own memories and feelings, your own sense of connection, but for your parent or loved one it is as though you are meeting for the first time, over and over again. At the same time, conversations are difficult because your parent or loved one may have begun to speak gibberish, unable to connect thoughts and sentences in a way that makes sense to anyone. While even people who are not familiar with the specific symptoms and effects of Alzheimer’s know that it affects a person’s memory, only those who either work with Alzheimer’s patients or have a parent or loved one with the disease know the impact it has on friends and family members. As the disease progresses and memories of faces and events grow ever more distant there grows in friends and family members a sense of both helplessness and hopelessness. You begin to wonder if it even matters if you visit because your loved one does not remember you anyway. You may even have anxiety because it fills you with grief that not only does your loved one not remember who you are, but won’t remember that you were there to visit. There is a temptation to stop visiting, to stop calling, to stop the heartache. If you are struggling with making continued visits to your parent or loved one, it might be helpful to remember that if your parent or loved one is happy to see you, even if they do not recognize you, what you bring during your visit is a brief time of happiness and peace. During days that melt together, your visits matter. 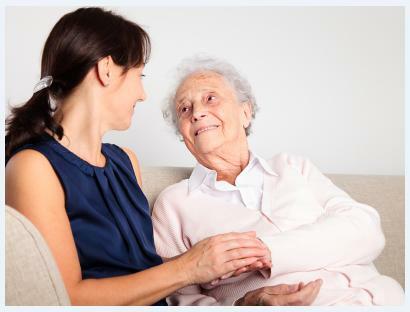 Your loved one or parent has feelings, and while you are introducing yourself for the 50th time in a row, there is a “knowing” feeling for your parent or loved one that you are someone they should know, even if they seem confused about it. As difficult as it is, we need to overcome the wash of emotion that belongs to us when we visit. We “miss” our parent or loved one being the way they used to be, seeing their personality and having a conversation that makes sense, but if we can shift our perspective and focus, our visits can take on new meaning and purpose. Moments of comfort, even when they are fleeting, are good for the soul. Your time with your parent or loved one is making impressions on the soul, even when you cannot see the impression or the effects of it. At the same time, regardless of what your parent or loved one remembers of the visit five minutes after you leave, when you are there, they are physically present. There is no way of ever telling what lies inside them, deep in the recesses of their thought. We are told we need to live in the present, not worry about yesterday or tomorrow, but live for the moment. Alzheimer’s patients do exactly that. They live in the moment. They do so in a way that we cannot comprehend. They do not remember three minutes ago let alone yesterday, and do not worry about tomorrow. If we can set aside our heartache or anxiety with this in mind, plan visits and conversations that do not connect to anything but the moment, we are filling the moments of our parent or loved one with contentment and peace. Bring along a picture book, music or flowers. Look out the window and talk about the weather. And even when your parent or loved one’s capacity to converse or communicate is impaired, continue to put out simple thoughts, simple ideas. Don’t try and connect the dots of their life to the present. If you can begin to understand, truly understand, what it means to live in the moment, you may ultimately discover is peace. You may understand that the struggle of life includes wiring the present moment to people, places, emotions, memories, or events in either the past or the future. That struggle ends when we stop trying to connect our present moments to another time. And although this is generally what our conversations with others are comprised of, that is not usually a possibility with a parent or loved one with Alzheimer’s. Everything is of the moment. Everything is fleeting. Today is a new day. This is a new moment. Live for the moment. Let your parent or loved one live for the moment. Together, you will build many moments filled with joy and peace.